Beam: 12 ½ ft. overall. Prior to WWII, 18 Fast Launches of the "bird" class were completed by British Power Boats between 1937 and 1939. Additionally 10 Generals class Fast Launches were completed by 1939, these later became target towing launches. During the war itself other builders completed 21 Fast Launches of the Derby Winners class; all being hastily put into service. During 1943 the War Department realised that there was a requirement for a large number of Fast Control Launches to be used to "shepherd" the amphibious DUKWs onto a beach-head. 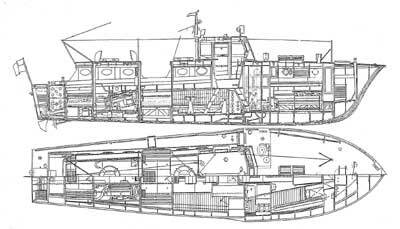 The "River" class were therefore conceived as part of the overall planning for the invasion of France. No doubt several builders of the time submitted their ideas for the new War Department FL, however as a result of the department's enquiry, George Selman submitted a proposed design, which was a modified version of the well known 41¼ft RALF seaplane tenders that were being built in vast numbers by British Power Boats. Although the 41¼ft FL proposal was not adopted, the British Power Boat Co did win the tender to build the 44¼ft Fast Launches under contract no. CTS/V/4229/(DCI) and 98 craft were ordered on 30th September 1943. The approximate value of the order was £411,609 which was equivalent to £4,200 per craft. The first of the War Department "River" class launches was completed on the 1st November 1944 and entered Army service on the 20th June 1945. A total of 11 units had been handed over to the War Department by the time that the original order for 98 craft was reduced to 40 by the cancellation of 58 units on the 3rd September 1945. This was due to the reduced requirements after VJ day in August that year. The cancellation left the builder with a balance of some 29 units to complete with a revised value of the whole order of £168,000. Despite the end of the war production and completion of the 44¼ft FLs continued at some pace. According to BPB records, by the 30th September 1945, some 17 units had been completed leaving 23 to be finished. By 1946 the yard had shifted emphasis to the Scottwood House pre-fab construction programme to offset the post-war shortage of Government boat orders. Completion of the "River" class FLs slowed as a result of the shift of labour to other work. With Scott-Paine in the USA and the retirement of the yard's General Manager in 1946, Scott-Paine made the decision to close down the Hythe yard after being informed by the new Manager that it was uneconomical to run. 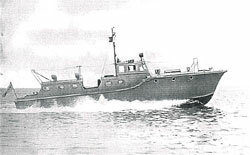 The last of the 68ft RAF HSLs was completed by March 1946 and as the final MTB for the Royal Navy, MTB 521, was completed, the RASC River class FL HUMBER was probably the last service craft to be built at Hythe, completing on the 1st November 1946.